Attention Deck Builders - you need DeckLok to meet code!DeckLok Deck Bracket System by Screw Products, Inc.
"…define the minimum concentrated live load for guardrails and handrail as 200 pounds of force (lbf)." International Building Code (IBC) Section 1712.1 indicates that “structural unit and connections” shall be tested as indicated in Section 1714. Section 1714 utilizes a safety factor of 2.5. Therefore, according to standard building codes, each guardrail design, when tested, must successfully withstand a load of 500 lbf (200 lbf x 2.5 safety factor = 500 lbf), applied at the top in any direction, to be considered a code compliant assembly. DeckLok Advanced Anchoring System easily meets and exceeds this requirement, and has been tested to withstand these loads, with up to a 1,500% increase in strength as shown in the Summary of Test Results below. Excerpts from these studies were published in the March/April 2005 issue of Professional Deck Builder magazine (see www.nadra.org) in an article titled “Alternative Hardware for Guardrail to Post Connection Test Results” by authors Michael G. Morse and Daniel P. Walsh, P.E. "Common and industry-accepted practices for deck railing construction and attachment can lead to unsafe and potentially life threatening installations. Many of these installations may quite possibly fail to meet the minimum IRC requirements for lateral loading. With every test that was run, a control test unit was tested first to establish a baseline performance level that represents the current construction methods used in the deck building industry. In all cases, the deck railing system represented by the control test unit failed at the connection points, and failed under lateral loads that were below the minimum IRC load requirements. The alternative deck railing construction method that utilizes the DeckLok bracket system resulted in significant improvement in the deck railing performance. All bracket tests resulted in deck railing load resistance that surpassed the minimum IRC lateral load requirements. Under continued loads far beyond the minimum requirements, the primary failure was ductile, rather than timber failure. That is, the rail post (4x4) was allowed to shift gradually, transferring load to the decks structure and remaining substantially intact. This introduces a controlled, predictable mode of failure and moves catastrophic failure to a secondary failure position. The brackets exhibited excellent ductility and provided reasonable warning that the deck guardrail was in danger of being overloaded and pushed to failure. That same ductility also allowed for a realignment of the timber members of the deck to more effectively absorb energy." The table below summarizes the test results. With the DeckLok brackets installed there is a substantial improvement in lateral load capacity. The load capacities shown in the column titled “Load Capacity with DeckLok” reflect the average of the three test units in each configuration. Please note that, in each test of every configuration, the minimum load requirement was met or exceeded. *Includes some or all units that did not fail. We started the research program by testing commonly used post-to-deck connection configurations in our area, including bolts, lag screws, notched and un-notched posts, and blocking attached in various configurations between the joists and band joist. None of these designs reached the target test load of 500 lbs. needed to claim a code conforming connection assembly. The failure modes for the different configurations were interesting to observe. Five specimens of each configuration were tested. Two details tested using ½-inch lag screws or bolts are depicted in Figures 3 and 4. Both details relied on 2-inch decking screws and three 3-inch stainless steel screws to connect the band joist to the joists. We included the southern pine 5/4 deck board in the tests to be representative of what contractors may be using in the field; however, it should be noted that relying on decking screws to stabilize a rail post connected to a band joist is an unreliable practice as the deck board may be replaced with deck boards and fasteners significantly weaker than what we tested (2” screws connecting 5/4 southern pine to southern pine joists). The lag screw connection detail shown in Figure 3 failed in withdrawal of the threaded portion from the band joist at average ultimate load of 178 pounds. These results were disturbing, as the average ultimate test load was below the code requirement of 200 lbs. Thus, these designs are deficient when perfectly constructed in a laboratory environment, and moreover, would contain no in-service safety factor. When the lag screw connections failed, the post completely pulled away from the deck system often with no audible warning. If a person were leaning against it, they would probably fall unexpectedly because complete failure occurred suddenly. The first row of Table 1 gives a summary of the tests results for the lag screw case. Deflection at design load (200 lbs.) was not recorded and reported because the assemblies, on average, failed before reaching 200 lbs. The average test load was only 35% of the test load requirement for a code conforming design. joists as the screws that attached the band to the joists pulled out, or failed in a withdrawal mode. As stated earlier, a 5/4 deck board was screwed to both the joists and band joist, however, the screws failed early in the test and did not provide the load capacity needed. Over a three month period, we tested a variety of designs involving the use of 2x8 southern pine blocking that were “lag screwed” to the joists, and had bolts installed through the band, the post and the blocking. The idea was to distribute the load over numerous lag screws and hopefully achieve the 500 lbs. test load level. However, these designs did not withstand the required load because the lumber failed in tension perpendicular-to-the-grain in the blocking. Some configurations included notched 4x4 posts attached with bolts to the band joist. Although none of the 4x4 laboratory test posts failed at the notch, notching reduces the strength of the post significantly and guardrail posts should not be notched. Repeated in-service moisture cycles typically cause cracks to develop and propagate, parallel-tothe-grain, from the corner of the notch. According to the grading rules for lumber, a 4x4 No. 2 Southern Pine can have a “slope of grain” up to 1:8 (one inch in eight inches). For example, assume a 4x4 is notched 1.75-inches deep and it has a slope of grain of 1:8. As a result of crack propagation along the grain, it is possible for the 1.75-inch thick section at the notch to be reduced to an effective section of about ¾-inch at 8-inches above the corner of the notch. Thus, notches in guardrail post, coupled with “grade permitted” slope of grain and moisture cycles, can produce a very weak guardrail post during the service life of the deck. Excerpted from March/April 2005 Professional Deck Builder Magazine. DeckLok has been tested at an ICC accredited laboratory and shown to meet code. View our test data report for WSU Wood Materials and Engineering Laboratory College of Engineering and Architecture. DeckLok is an advanced lateral anchor that secures deck components to the structure of the deck in a way that will revolutionize the deck industry. This patented anchor system strengthens the vulnerable connections between deck components by adding a bolted attachment at critical structural locations. The DeckLok anchoring system provides the strength required to meet IRC 2012 Safety Code requirements for both lateral pullout and rail post stability while using your current deck construction techniques and designs. The anchor is available in code compliant Hot Dip Galvanized coating and in 304 or 316 stainless steel. One DeckLok anchor provides a 500% increase in rail post strength, while two DeckLok anchors provide 4,000 lbs. of ledger board pullout resistance. DeckLok transfers the load from the joist of the deck (a structural element) to the joist of the house (also a structural element) by connecting the deck to the floor joist system to form one unit. DeckLok adds 4,000lbs of lateral resistance per set of DeckLok Brackets along the ledger board. The lateral load connection required by section R502.2.2 shall be permitted to be in accordance with figure R502.2.2. 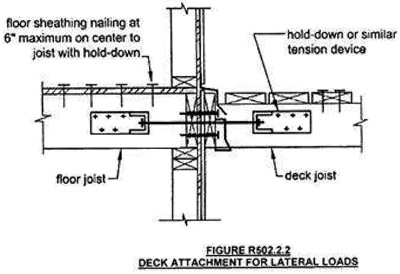 Hold-down tension devices shall be provided in not less than two locations per deck, and each device shall have an allowable stress design capacity of not less than 1500 lbs. "Commenter’s Reason: This comment responds to the issue of band joist anchorage raised in the code development committee comments. Deck failures do occur were the deck is attached to the rim joist for lateral loads, but the rim joist is not adequately anchored into the floor system. Positive anchorage of the deck joists to the floor framing addresses this potential failure. The figure is based on a similar figure from FEMA 232." SECTION R301 DESIGN CRITERIA R301.1 Application. DeckLok Brackets placed three feet from each end of the deck, then every 6-8 feet along the rest of the ledger will easily and effectively transfer loads to the foundation of the home. IRC Tables R301.4 and R301.5 state “…define the minimum concentrated live load for guardrails and handrail as 200 pounds of force (lbf)”. International Building Code (IBC) Section 1714 per IBC Section 1712.1, the “structural unit and connections” shall be tested as indicated in section 1714. Section 1714 utilizes a safety factor of 2.5, a number that has been in the model codes for decades for testing structural assemblies. Therefore each guardrail design must successfully withstand a load of 500 lbf (200lbf x 2.5 = 500lbf), applied at the top in any direction, to be considered as a code compliant assembly. DeckLok easily meets and/or exceeds this requirement since DeckLok has been tested to withstand up to 1,100 pounds of force with treated hem-fir and 2,000 pounds of force with southern yellow pine.